Summary : A simple method for identifying the needs of orphans and vulnerable children, and tracking changes in their situation over time. Working with orphans and vulnerable children can be extremely challenging in developing countries. There are usually only a small number of staff available to monitor the children’s well-being, and often those staff have limited training and experience. As a result, many programs deliver a standard set of interventions for every child, regardless of the child’s actual situation. For example, all children may be provided with school materials and uniforms, even though only some children actually need them. It can also be difficult to know which children need the most help, and whether or not the well-being of the children is improving or deteriorating. 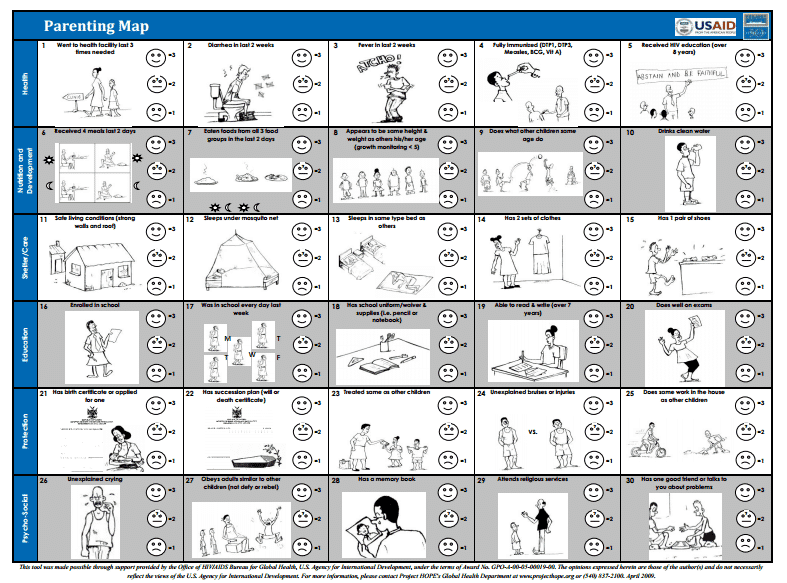 To help address this problem Project HOPE created the Parenting Map, with a matching training guide and practical exercises. The purpose of the Parenting Map is to give an overall picture of each individual child in order to better address their specific needs. It can also be used to measure changes in the child’s situation over time. The Parenting Map has 30 basic questions about the child which can be answered with a “good” (smiley face), “don’t know / not sure” (neutral face) or “bad” (frowning face) – see the image below and the link to the full tool. The questions cover health, nutrition and development, shelter / care, education, protection, and psycho-social issues. Each question is accompanied by a picture to assist those with low literacy. Once the scorecard has been completed for each child the staff member or volunteer should help the caregiver prepare an action plan to improve for next time. For example, if the child has no shoes (Question 15) then the action would be to buy them shoes. I assisted with the implementation of the Parenting Map for a program helping orphans and vulnerable children in Cambodia. The program was originally designed to provide the same support to all children. We wanted to start using the Parenting Map to help tailor the program to individual children’s needs and to measure improvements over time. Overall the Parenting Map was relatively easy to implement. Our field staff were all volunteers, many of whom had low literacy. After one day of training, including role plays and a pilot test, they were able to confidently use the tool with caregivers. It took around 20-30 minutes to go through all the questions with each caregiver, and the caregivers were happy to answer the questions. We did encounter a few problems with specific questions. For example, Question 28 asks if the child has a “memory book”. Our staff and volunteers had never heard of a memory book before (“Is it like Facebook but for orphans?”). So we ended up changing the question to “Does the child have a photo album to help them remember their parents?”. This shows how important it is to pretest and pilot the tool before using it in your own target area. Our volunteers also tended to spend more time collecting the scorecard data, and less time helping the caregiver create an action plan for improving the situation. The action plan is the most important part, so it could be a good idea to spend more time on this during the training session. This scorecard can then be used to create an action plan for the child. 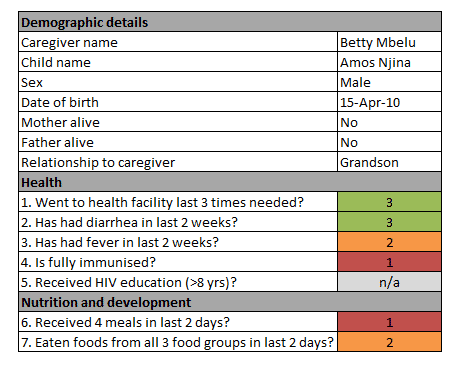 In the example above, this child’s caregiver and the program staff should create a plan to take the child for immunisations (Question 4) and feed them more meals each day (Question 6) as the first priority. Once you have the scorecards for individual children it is also possible to create a total score for each child. However, the training guide did not clearly explain whether this was a good or bad idea. Our team decided to create total scores to help us identify children at high risk. 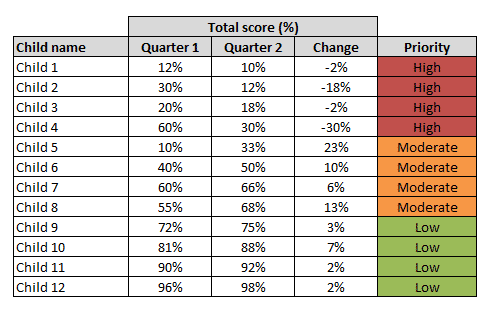 For example, if a child had a score of 20 out of a total possible score of 90 (22%) they were given higher priority (and more follow up visits) than a child who received a score of 70 out of 90 (78%). The main problem we had with creating total scores was that the score for “Not Applicable” was 4, which meant that children who had a lot of questions that were not applicable ended up with higher scores. To fix this we just removed all scoring for questions that were not applicable. You can also calculate what percentage of children have received each item on the Parenting Map tool, and how this has changed over time (see example below). This can be used to show whether the program has been successful. The main limitation with the Parenting Map tool is that it only includes information on the 30 items included in the tool. While this list of items is extensive, it doesn’t cover all the problems that orphans and vulnerable children may face. 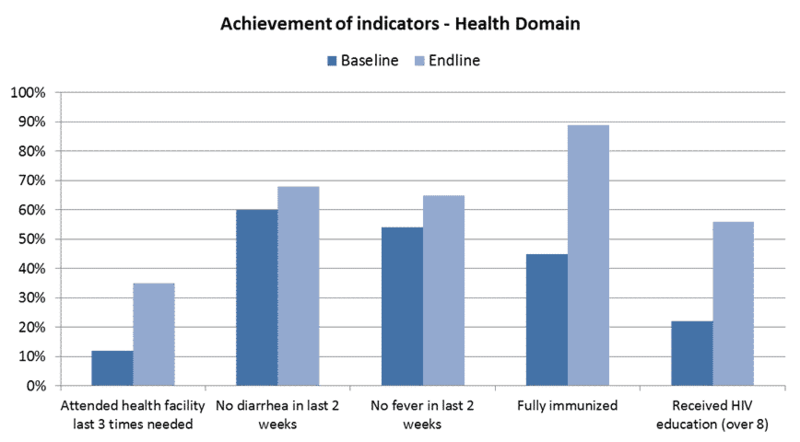 For example, the tool only asks about diarrhea and fever, but would not pick up on a child who has had other illnesses. There is a risk that staff members and volunteers will only focus on the issues listed in the Parenting Map, and may ignore other serious problems that the child is facing at home. The Parenting Map is not a replacement for good case management, well trained social workers, or detailed case notes. However, it can help to bridge the gap when these things are limited or completely absent. The Parenting Map may also be inappropriate in special circumstances, such as conflicts or refugee camps, where children may be exposed to a range of risks that aren’t captured on the standard version of the tool. The Parenting Map is a simple method for identifying the needs of orphans and vulnerable children, and tracking changes in their situation over time. You want to tailor a program to the individual needs of children. You need to track the wellbeing of children over time. The staff members or volunteers visiting children have limited training and experience. Caregivers, staff and/or volunteers have low literacy. There are well trained and qualified social workers visiting the children (in this case more comprehensive tools and case notes should be used). Children are likely to experience risks that are not captured on the tool (such as in a conflict situation).